At his 8week weigh-in, his first for over a month he weighed in at a whopping 11lb 14 oz…. He’s jumped from the 25th percentile to the 75th! The doctor checked his reflexes etc and everything’s good… We were all chuffed with his weight! Last week he had his first jabs, the nurses were fab… One on each side while I held him and they were very quick and soothing! He cried for a minute or so then slept for hours! 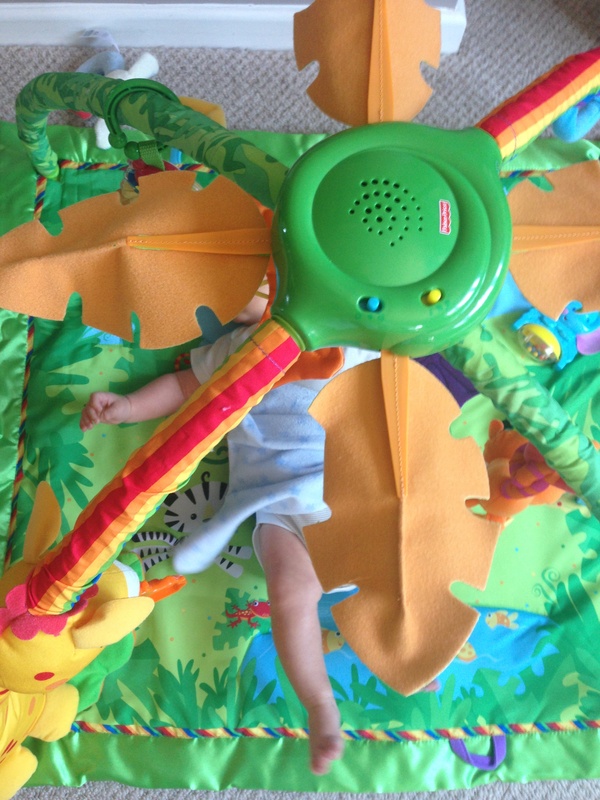 Hiding in the fisherprice jungle play gym! Talking of grabbing, he has a teddy/comforter that he now loves to bits… So cute how he holds on to it while sleeping, feeding, playing and trying to use it to cover his face when he’s tired! We’ve started chatting! When he coos, we coo back at him and it turns into little chats… Again, so cute!! Sleep? 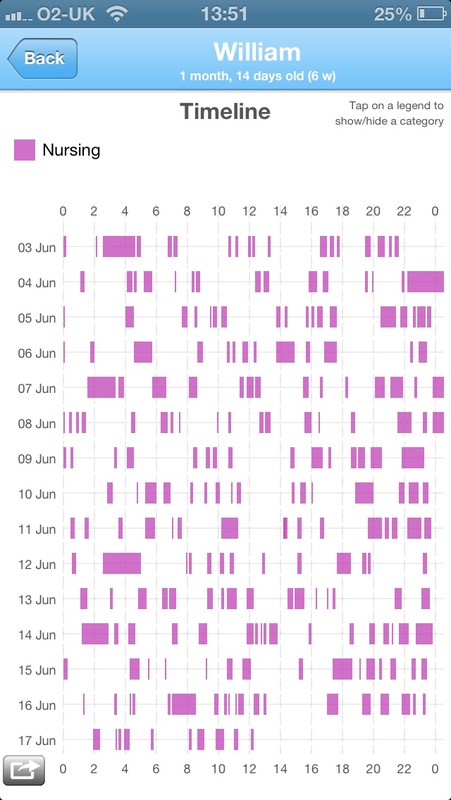 Generally he sleeps for 3 hours between about 12 and 3am, then wakes up every couple of hours, but only for short feeds (about 10 mins) so hoping this means he’s getting closer to sleeping through… And he always has a big feed about 10-11pm. A couple of times he’s slept for 4 hours so I think we’re getting there slowly…. Not entirely sure if he’s hungry in the early hours as the feeds are quite short or whether he just wants comfort so not sure if a dummy would get him back to sleep just as easily? Every evening he has a grouchy hour or two when he cries whether he’s feeding or not… The health visitor suggested I might be a bit dehydrated and he’s crying when feeding as he’s not getting what he needs…. I’ve tried drinking more but doesn’t seem to have made a huge difference. His wind is at its worst this time of day too so I’m tempted to try something like infacol but haven’t succumbed to it yet. Any tips anyone?! He still goes to Swimkidz every Saturday morning and on his 9week birthday he was let go underwater twice... Eek! He’s very calm in the water which is a great start! 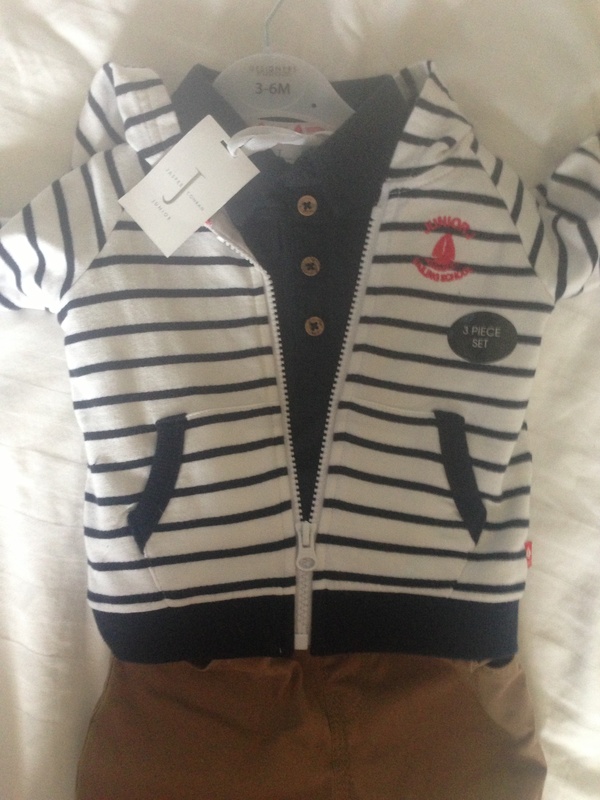 Lots more trips out… Shopping with mummy and aunty in the local designer outlet (cr*p celeb spot: Daniella Westbrook! 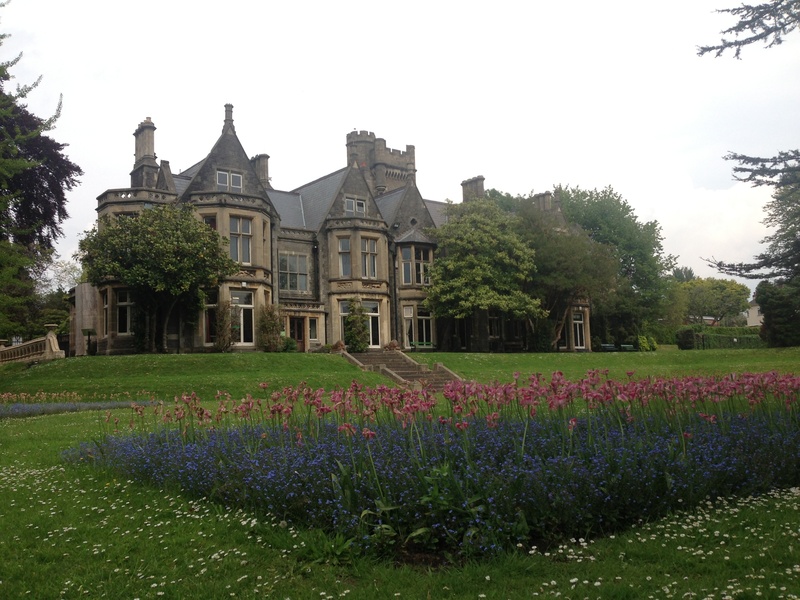 ), family day out to Margam park for the first time (lovely, defo will go back! 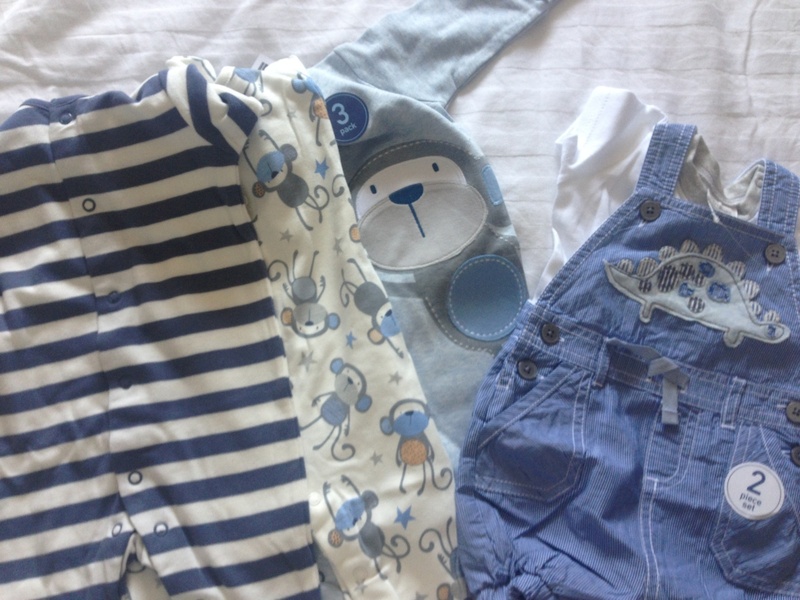 ), a coffee with mummy’s boss, his nanna’s retirement drinks in a busy pub on a Friday after-work… And he slept through all of these!! 100 thank you cards from Vistaprint! Co-sleeping – a common reality and guilty secret? NICE announced their new guidelines this morning, recommending against co-sleeping in baby’s first year due to the increased risk of SIDS. I’m no expert on SIDS and I have no idea on how many precious babies die because of co-sleeping. 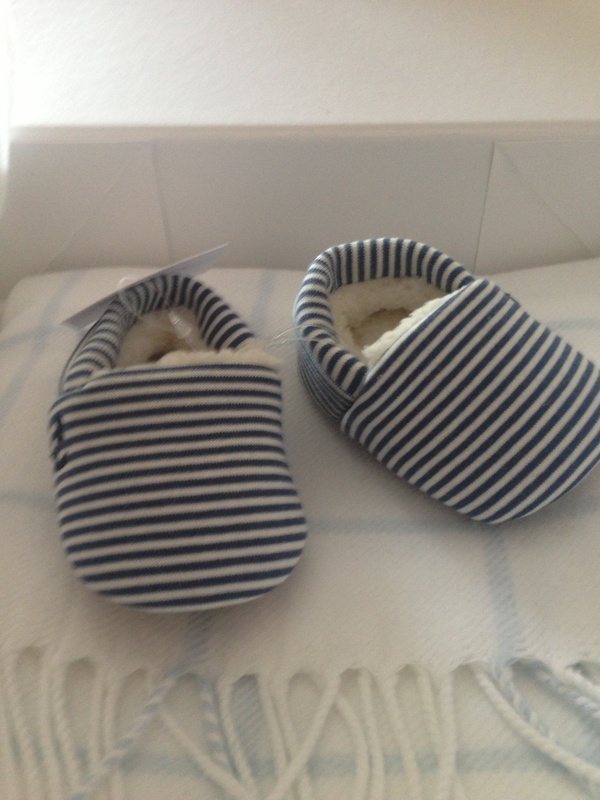 I am, however, a new mum and it was made very clear to us during pregnancy and these first couple of months that babies must sleep on their backs and NOT co-sleep, whether that be from midwives, health visitors, antenatal classes, books, magazines, apps…. ‘No problem!’ I thought, when W came along, he’ll sleep in his moses basket next to me. I went mad with my OH if he brought W into bed with us or had a nap on the sofa with him. Then sleep deprivation and reality hit in – W settles ok in his basket ’til about 3/4/5am but then gets difficult to settle so I tend to bring him into bed with us. At first I felt awful about this, and nervous, and scared. 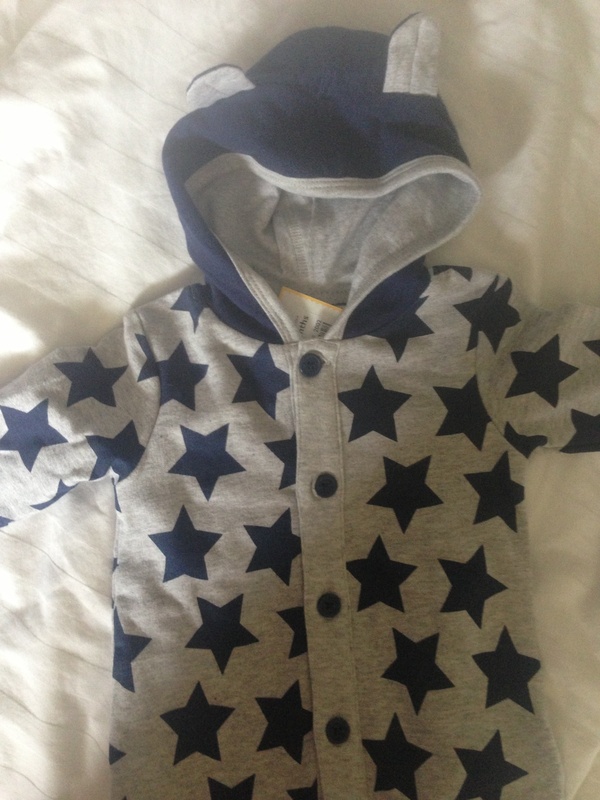 Then something strange happened – whenever I sheepishly mentioned this to family/ friends/ colleagues/ other bloggers and tweeters it turns out I wasn’t alone and I’d say 90% of them admitted to co-sleeping at some point or another… to comfort their babies and get some much-needed sleep. I’m sure I’ve read that sleep deprivation has the same impact on reflexes as drinking a load of alcohol. So what’s riskier – co-sleeping for a few hours? or being in charge of a baby on very little or no sleep?? As I said, I’m no expert and I’m not disagreeing with the guidelines. What I’d like to suggest is that the experts at NICE and the NHS recognise that a large number of parents co-sleep, and give guidance on how to do it as safely as possible. In my experience, co-sleeping is a common reality, but at the moment feels like a huge guilty secret. Again, could we reduce risk by making it less of a taboo? I’d love to hear your thoughts on this – do you agree with me, or do you think more should be done to stop people co-sleeping? 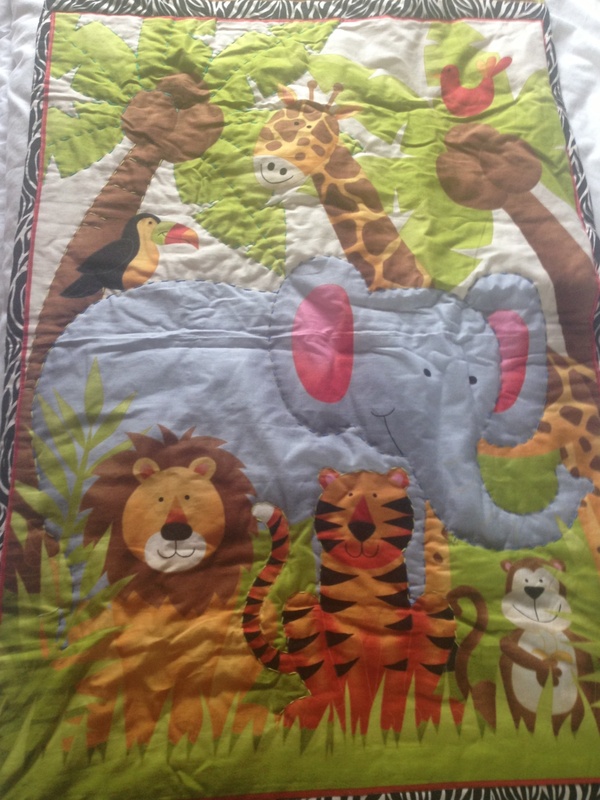 Author yummybloggerPosted on July 3, 2014 Categories opinion, parenting23 Comments on Co-sleeping – a common reality and guilty secret? First 4 hour sleep – about a week ago he slept for a full 4 hours in the night.. ‘hallelujah’ I thought… ‘we must be getting close to sleeping through…’ Alas, the next night he woke up for a feed ever hour! Just the last few days he’s been awake a lot more in the daytime, so hopefully we’ll see some longer night-time sleeps soon. We’re lucky in that once he’s had his night-time feeds he goes back to sleep pretty well. I should add that in the day too, his feeds have become a lot shorter and more frequent (perhaps increased thirst due to the hot weather? 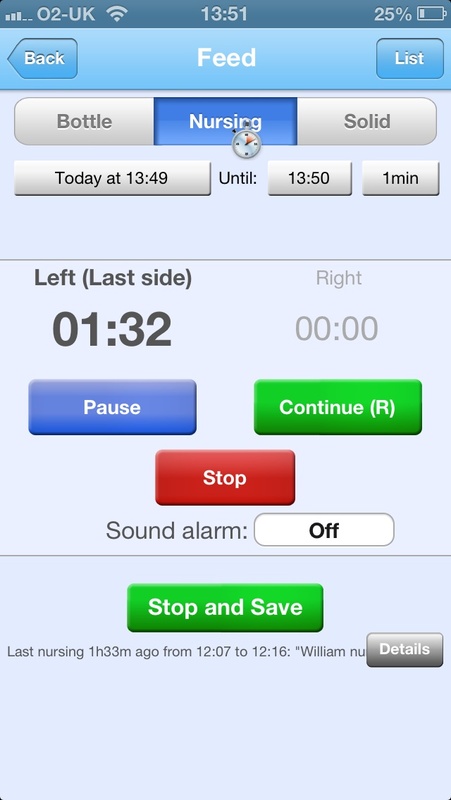 )… can’t work out if this is easier than longer feeds – they both have their pros and cons! First expressed-bottle feed – a week ago, he took his first bottle from his daddy. I will blog about it separately in more detail but it was a very proud, bittersweet moment – so proud to see him taking the bottle without a problem… so nice to see him being fed by his dad…. but also slightly sad as I guess it’s already the beginning of the end of his beautiful relationship with my breasts! 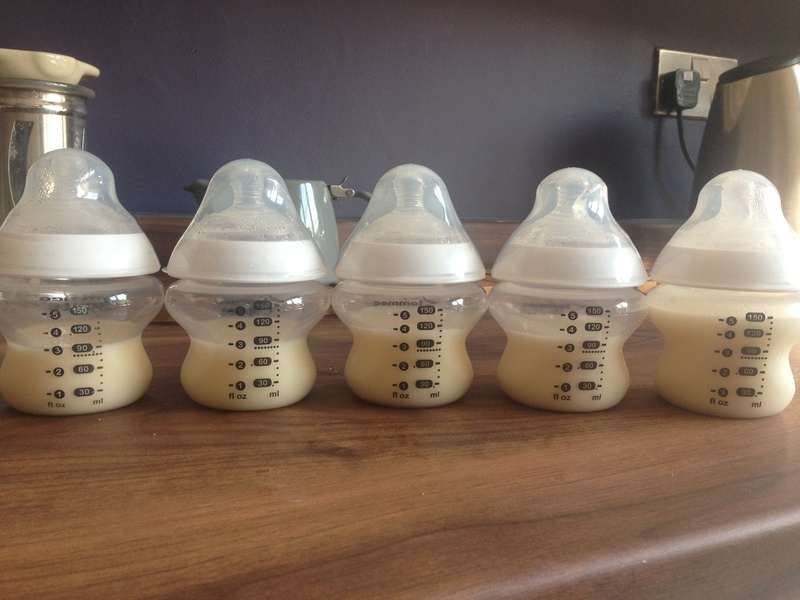 Getting bottles ready for mummy’s first night out! First pelvic floor class – this has to be one of the most surreal moments of my life but due to the ‘perineal trauma’ from my labour, I was invited to a pelvic floor workshop in the hospital… cue a handful of us sitting in a hot room for an hour being shown diagrams and demonstrations of our muscles ‘down there’ and how to heal them… I learnt a couple of new things but overall it was very random! Overall, as he’s getting busier I’m finding myself with less spare time which is fine… but trying to balance chilling out at home with getting out and about, and staying busy… I hope for us to start some classes next week, so that might help give us a bit more routine to work around…. 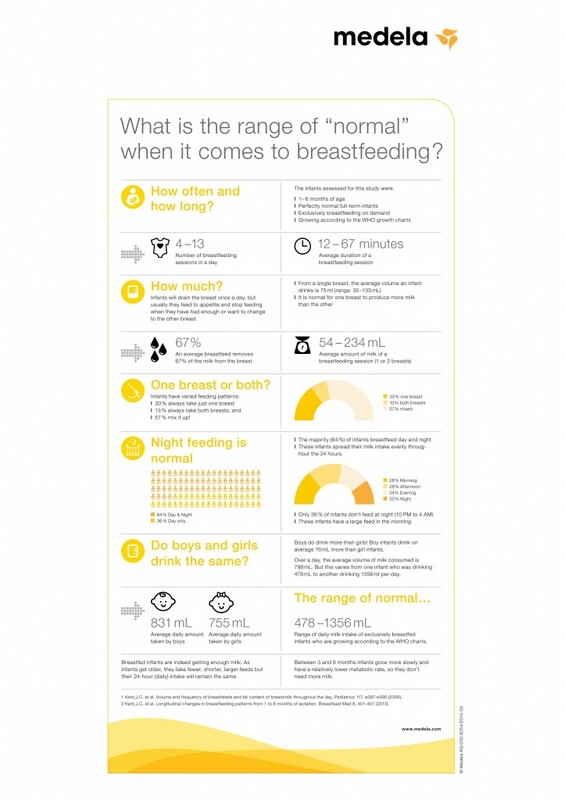 I was never going to blog about my breastfeeding journey… I’ve had a very easy ride so didn’t think I had much to share… but when Medela sent out a press release about what’s ‘normal’ when breastfeeding, it got me thinking that we should all share our stories and journeys to make sure that the next lot of mums-to-be have a wealth of resources and stories at their fingertips…. 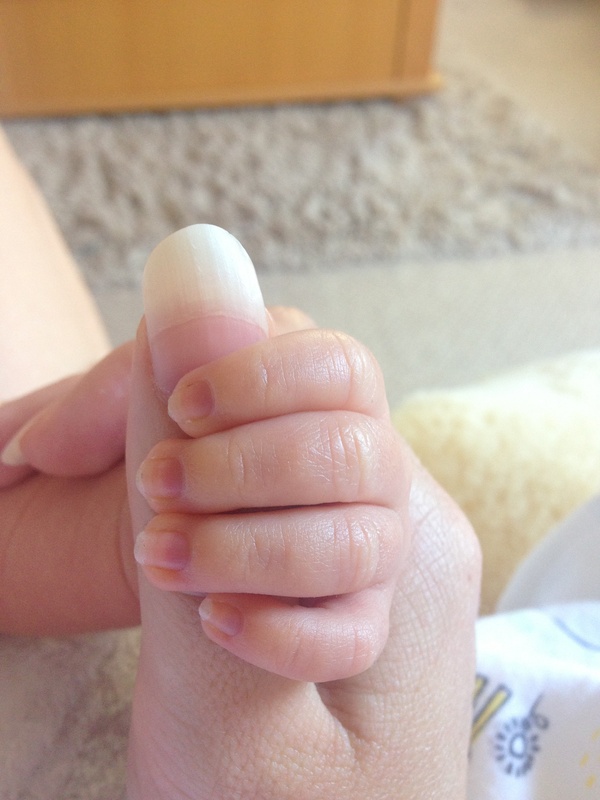 We were in hospital for just over 24 hours after he was born, which was handy as I was able to check with midwives that he was latching on ok, and they also advised me to take him off if he fell asleep/ stopped feeding… they also taught me to tickle his cheek to wake him up a bit while latched on. And that was it, we got home and little W wanted feeding every 2-3 hours on average. He’d usually start nibbling on his fingers or fist when he was thirsty/hungry but didn’t always… generally if he cried, it turns out he wanted feeding… even if he’d just had some a few minutes prior…. feeding on demand indeed! I feel so proud that he is growing and thriving purely down to my milk. I feel thankful to his daddy who’s been making sure I’m well fed – he feeds me, I feed baby! Having said all of this, breastfeeding isn’t some kind of paradise club. Nobody told me how exhausting and messy it is. With an (over-?-)active milk supply, whatever I’m wearing (and our bedding) get covered in milk. 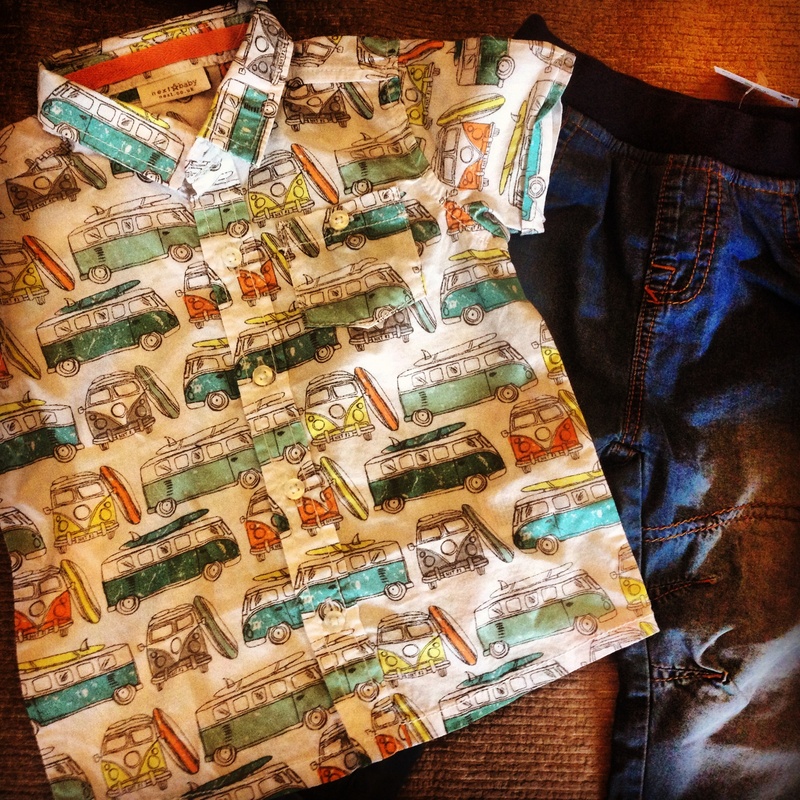 (I then use these T-shirts as bed sheets for W to comfort him at night!!). 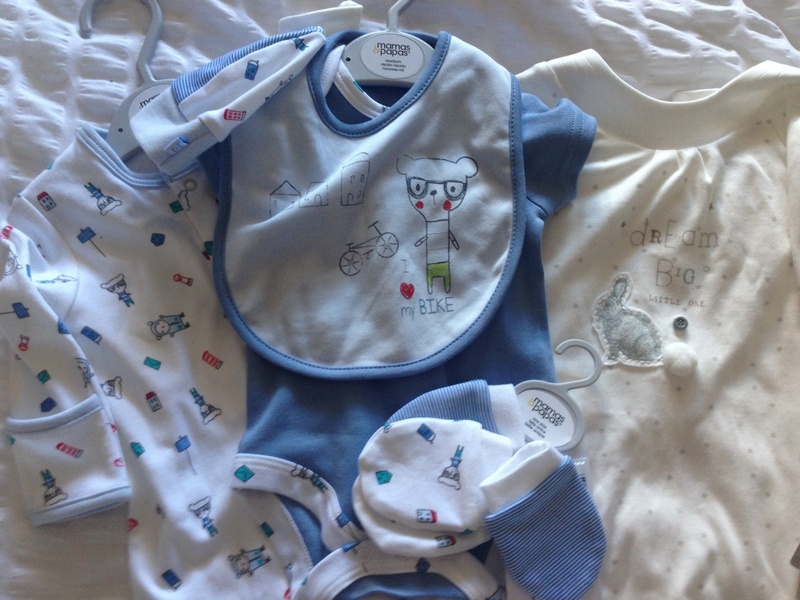 The next chapters in my Breastfeeding story will hopefully involve expressing so we can bottle-feed, trying to reduce the nightfeeds eventually and feeding him in public if needs be…. if you’ve enjoyed this post then please follow me on my journey via WordPress, Twitter or Bloglovin. What’s your Breastfeeding story? 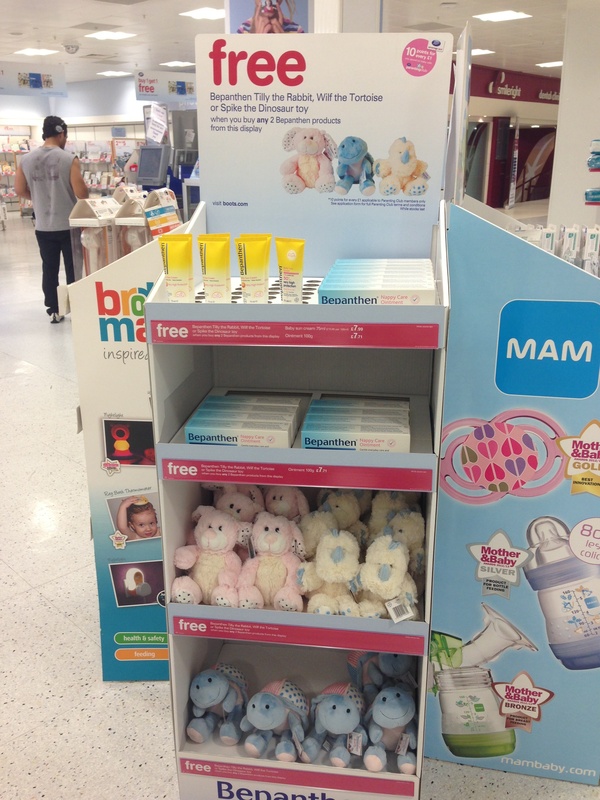 How do your findings compare with Medela’s? 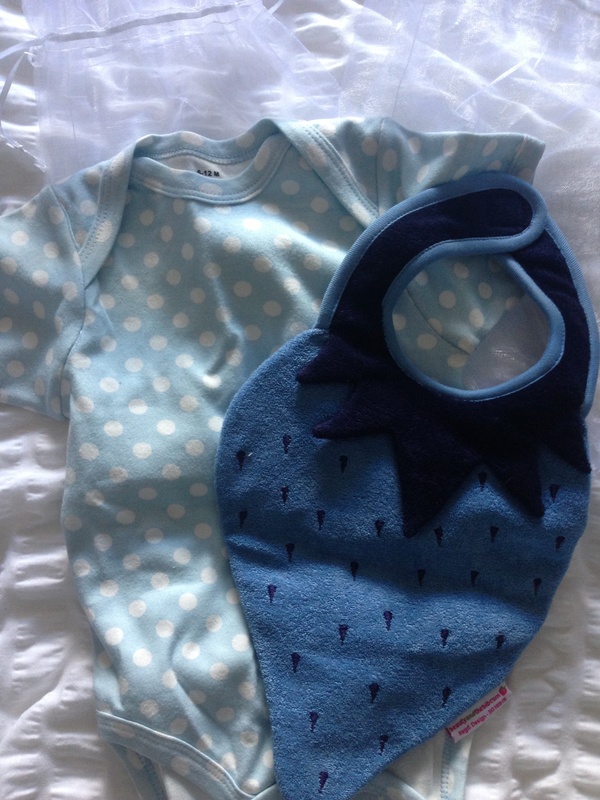 PS I’ve linked this up to Zena’s suitcase – new linky – Breastfeeding Diaries…. 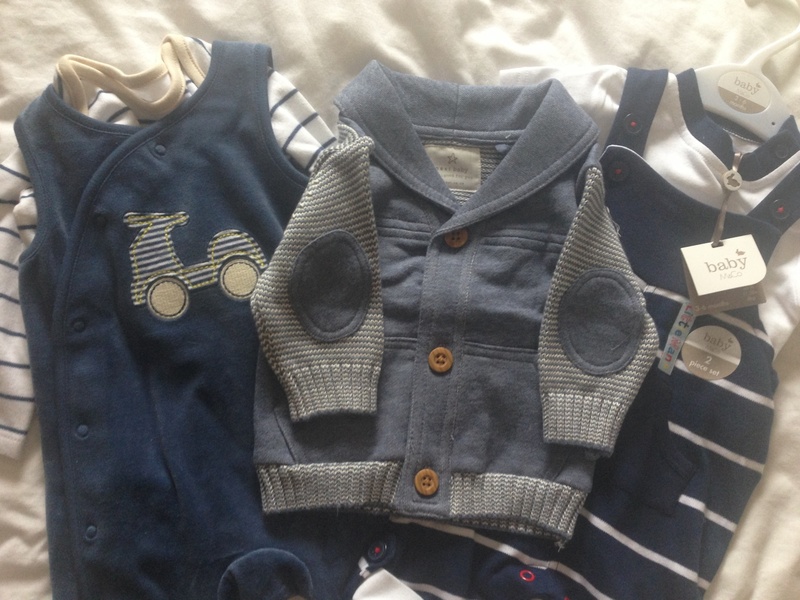 Little W is very similar to last week, we’ve had some better sleeps this week but other than that he continues to be extra cute and chilled, getting slightly bigger, louder and stronger by the day and week… This week we had a few firsts to share with you…. First swimming lesson! – we had a free taster lesson with Swimkidz, daddy was his swimming partner as I am a wuss in water… And the 3 of us loved it! I was one proud momma especially when he got dunked underwater and didn’t cry! We’ll now book a course and go every week, we’ll keep you posted! First trip to the hairdressers with mummy – I haven’t had my hair done since January so it was a bit of a mess! My hairdresser Maggie at Sweeney’s in Cardiff is a new mum on maternity herself but she was back in for a couple of days so I booked us in…. He would normally have slept through this time of day but he was awake for most of it and I had to do my first breastfeed in public! Then when the Hairdryer was on he finally slept in my arms 🙂 I was very lucky that Maggie and her colleagues were all hugely baby-friendly so I felt at ease the whole time despite his awakeness! First pub dinner – you’ll know that W has already been out for lunch, but this week he came up with us for a proper pub dinner as my parents were in town for the night, so we had a lovely meal in Cricketers, Cardiff and good little W slept through the entire 3 hours or so… Brilliant! 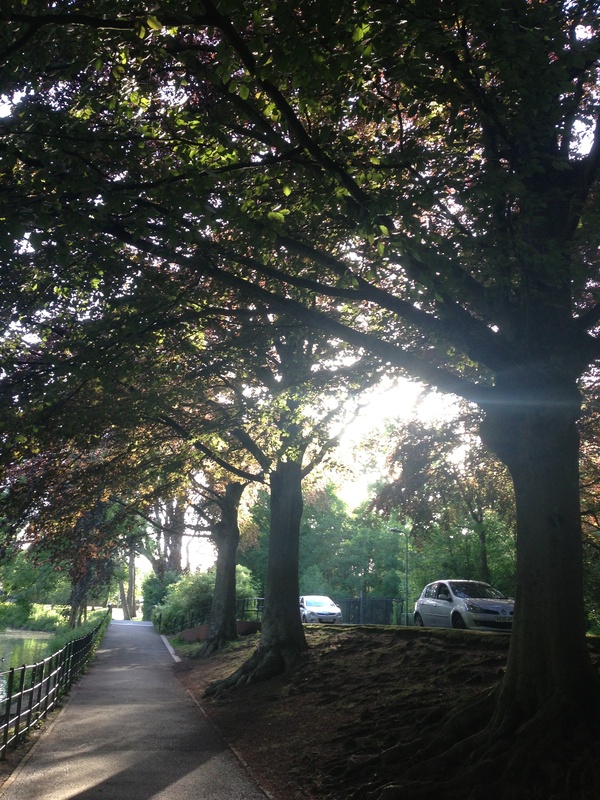 First family walk around Roath park – one of Cardiff’s most popular walks with young families, we used to go there for walks long before W was a twinkle in our eyes, so it was lovely to go there with him and turn into one if those families we used to look at and think ‘aww how cute’! Purchases and presents So it was a busy week! 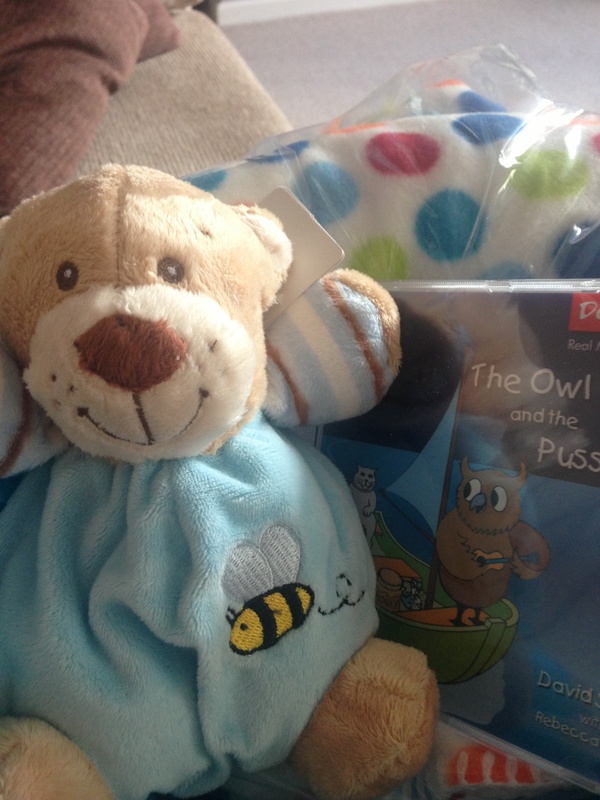 On top of that when my parents visited they brought him even more presents, inc. from their friends bless! 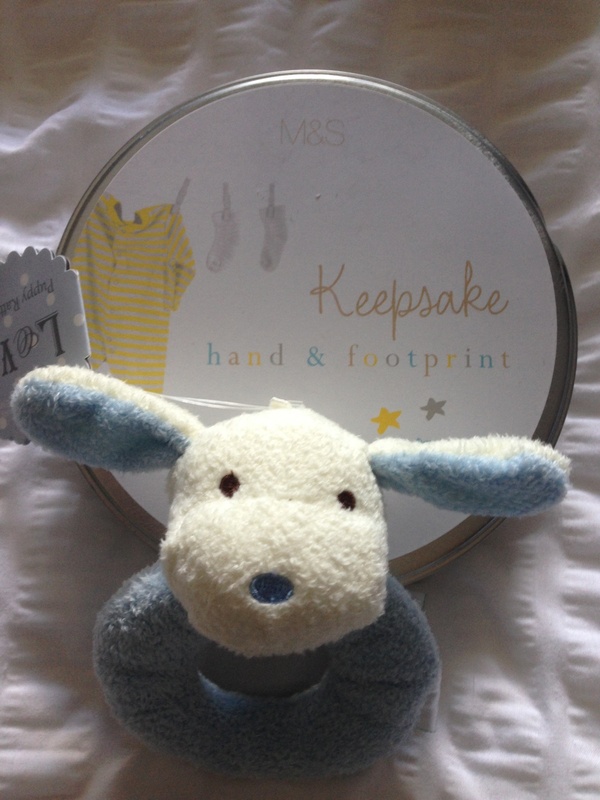 We still haven’t had to buy him anything since be was born really as he was so spoilt, we did stock up on Bepanthen cream and got a free teddy with it this week, oh and had to buy our first lot of swimming nappies! 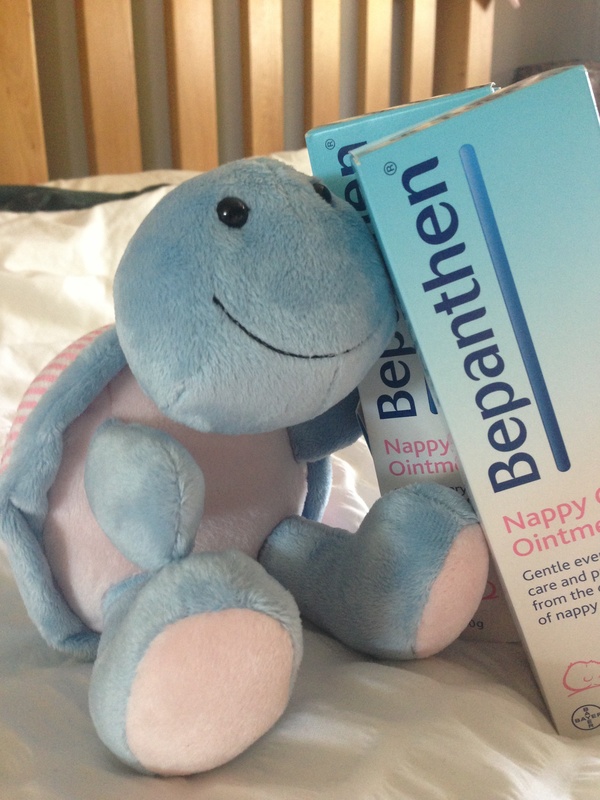 Little W got nappy rash quite early on at a few weeks old, we tried a couple of creams including Sudocrem but family members recommended Bepanthen and since we’ve tried that we’ve not looked back! 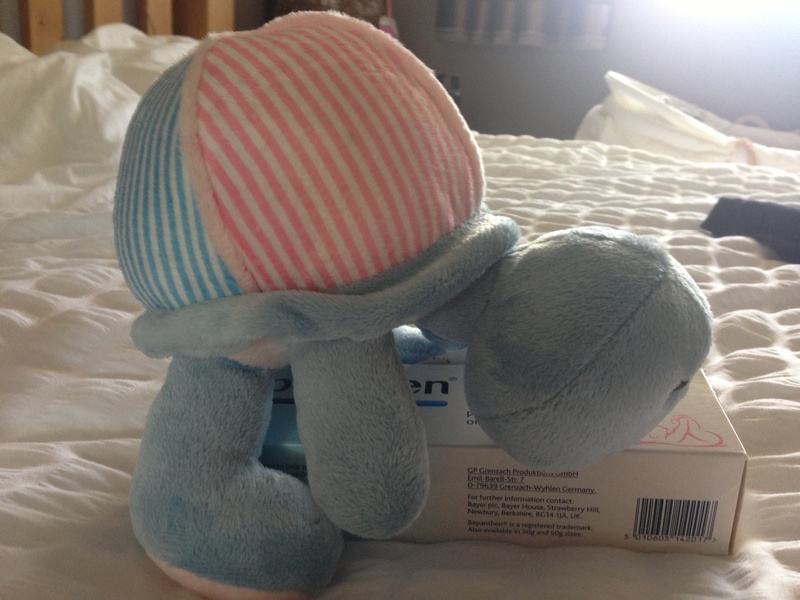 It cleared up a sore rash within 1-2 days (using it every time we changed his nappy, making sure his skin is clean and dry first) and now we use it to prevent future rashes coming back (it looked so sore bless him!) by using it nearly every time we change his nappy. I had a really tough time choosing between the tortoise and the dragon (the bunny is a bit too girly for W!) but plumped for the tortoise as mummy and daddy love tortoises! 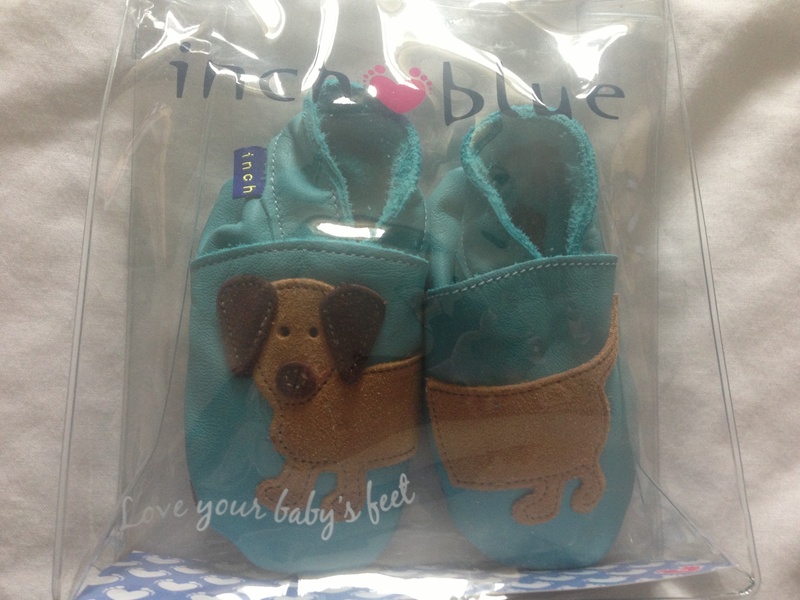 It’s good quality, soft, mostly blue with some pink…. 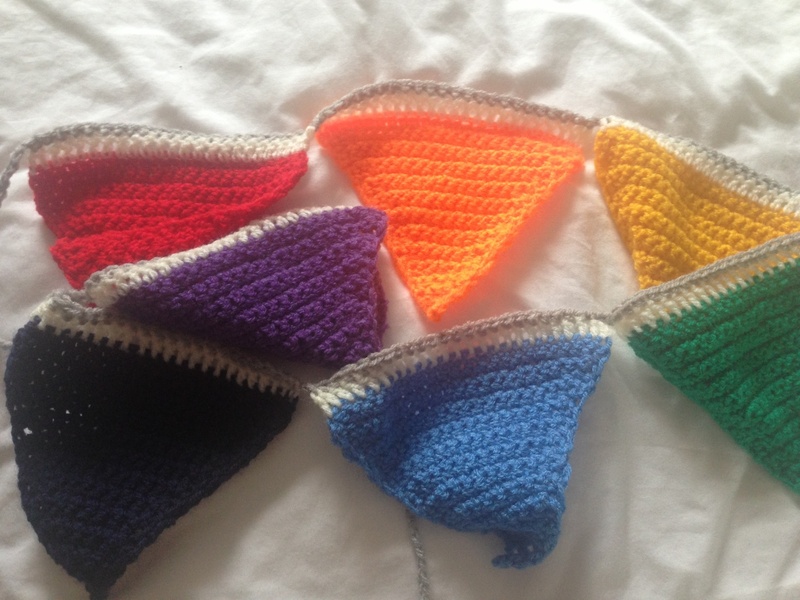 UPDATE (25/09/14) A lot of people seem to be finding this blog post when they’re searching for ‘Bepanthen toys’ – the Boots offer is now finished so I got in touch with Bepanthen to see if you can buy the toys anywhere. 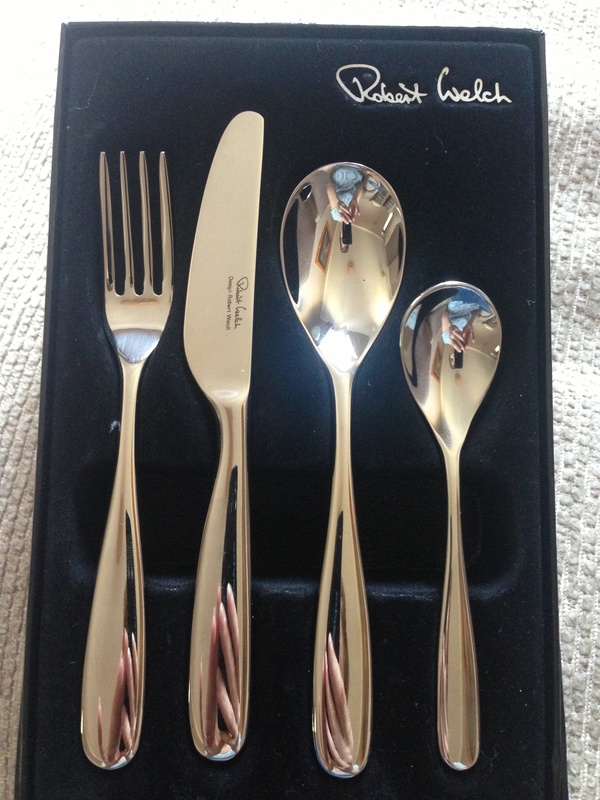 You can’t buy them but they do have some competitions where you can try to win one – good luck! I’m Welsh, I love cwtches and ‘cwtch’ is a word that’s part of my daily vocabulary especially now we have a newborn in the house. One of my blog readers recently asked what this word was – was it a typo? should it have read ‘catches’? 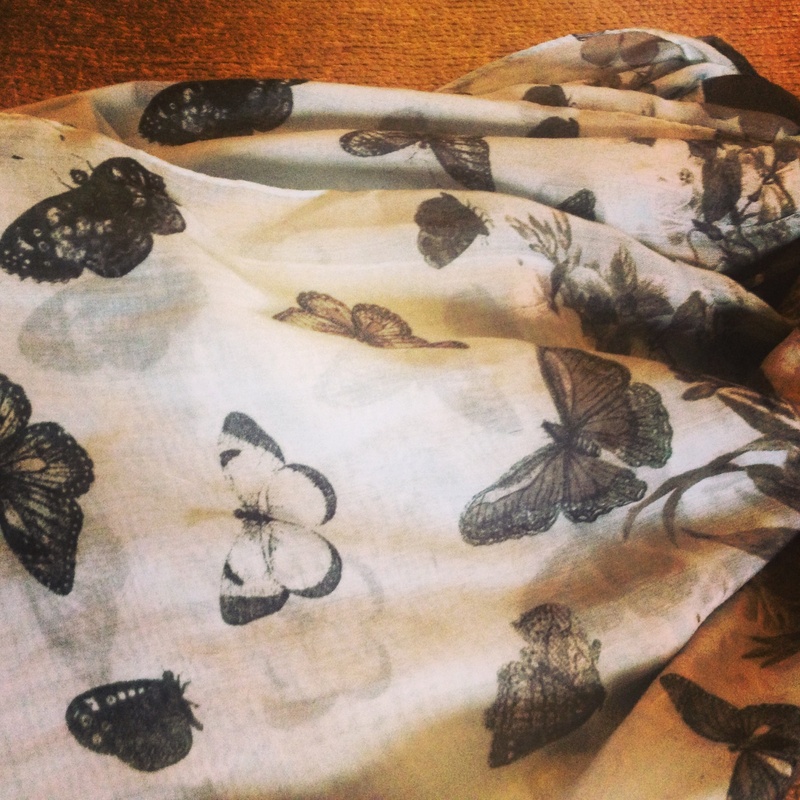 Most of you probably cwtch every day without knowing it…. In simplest terms – ‘cwtch’ is the Welsh word for a cuddle/snuggle…. but it’s more than that…. It’s a feeling you can’t describe… it’s holding on to someone with love and affection, squeezing them in tight to make sure they’re ok and letting them know that you’re looking out for them. Being in a cwtch is feeling warm and safe. I’d describe it as ‘coo’ (as if you were starting to say ‘cool’) and then ‘tch’ like the ‘tch’ in ‘itch’ or ‘witch’. That probably isn’t that helpful, so I found this link which has a really helpful button you can press to hear what ‘cwtch’ sounds like! 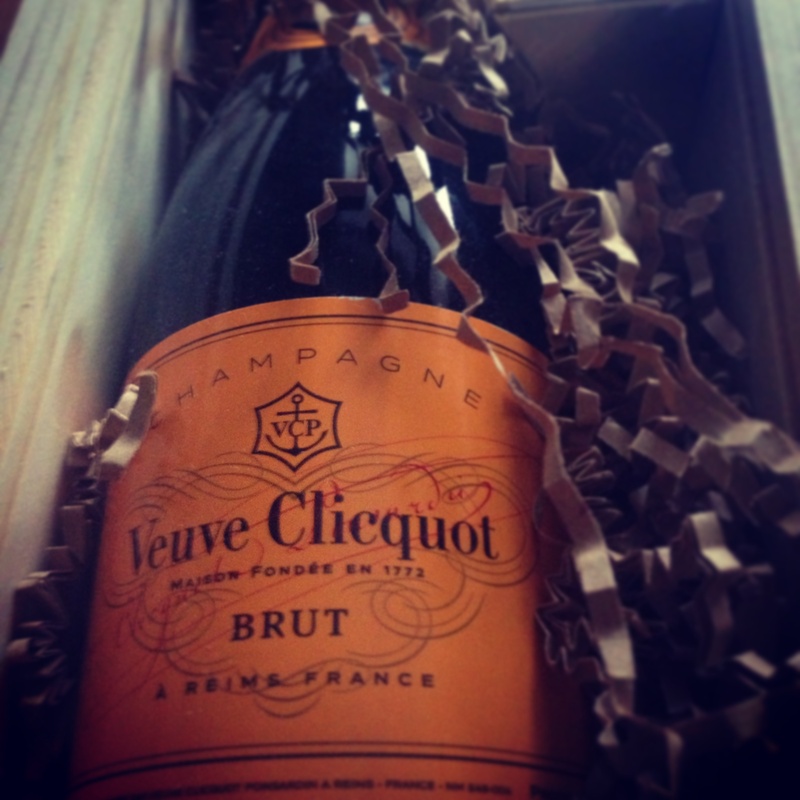 So there’s only one thing for it…. 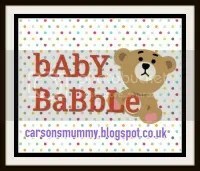 Author yummybloggerPosted on June 3, 2014 June 5, 2014 Categories parenting, randomTags cwtch11 Comments on What’s a Cwtch? 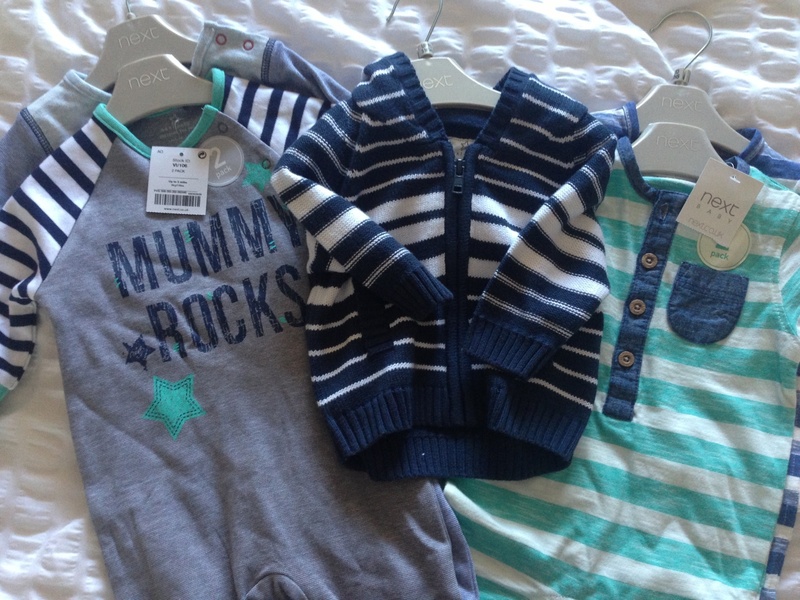 Week 4 – 4th week of being a mummy – wind and trips out! 4 weeks today our little W was born, and what a week this week has been! A few bad nights sleep… Similar to last week, we’re having unpredictable nights… Sometimes he’ll settle in his Moses basket, sometimes he won’t! We try a variety of tricks, candles, white noise apps, heating etc but seems to be pot luck as to how well he settles! Thursday – with the help of my sister we took W into town (Cardiff city centre) for the first time... We had fun working out how the bugaboo and maxi-cosi combo worked… Had an amazing lunch at torre cafe (very baby/ family-friendly, great food and cool decor, crockery etc) wi took a look round some non maternity clothes shops 🙂 then we had coffee and a cake… Perfect afternoon! 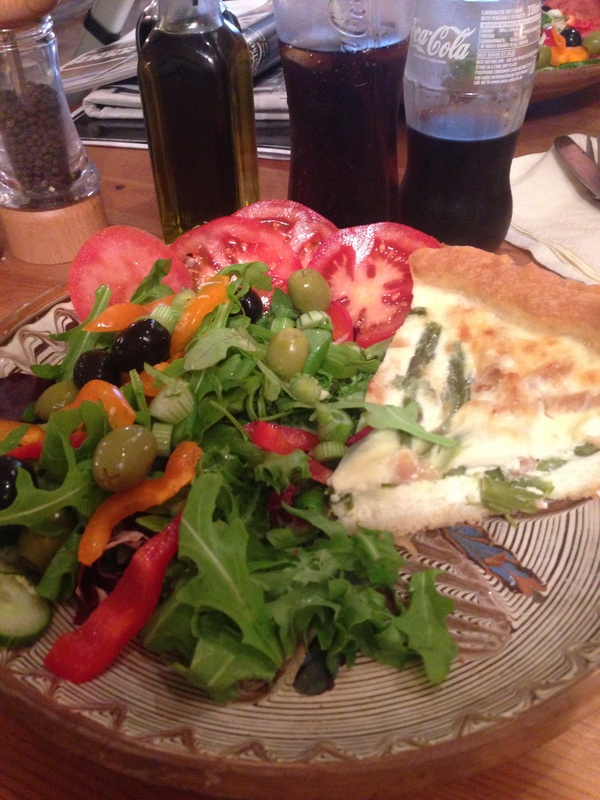 Friday – I did the same trip into town by myself eeek! Crazy the things to get nervous about..
What if I can’t get the pushchair to work ?! What if he screams and won’t stop crying!? After lunch I took him into work and was there for about an hour passing him around for cuddles and catching up with people! Then we called in to see his nan at work – she loved showing him off to colleagues! I couldn’t stop smiling as I pushed him back to the car park… The day had felt like a real accomplishment and my confidence had gone through the roof…. We can go anywhere and do anything now W! Monday we took him for a newborn photoshoot with the amazing and lovely Leah Roberts. We were there for 4 hours as he needed feeding a couple of times but he behaved apart from pooing and peeing over Leah… A lot! Amazing what goes on when the nappy comes off 🙂 Haven’t got the photos back yet but pretty sure she got some amazingly cute shots! My body isn’t quite back to normal but it’s getting there… I have good genes and breastfeeding to thank for that! 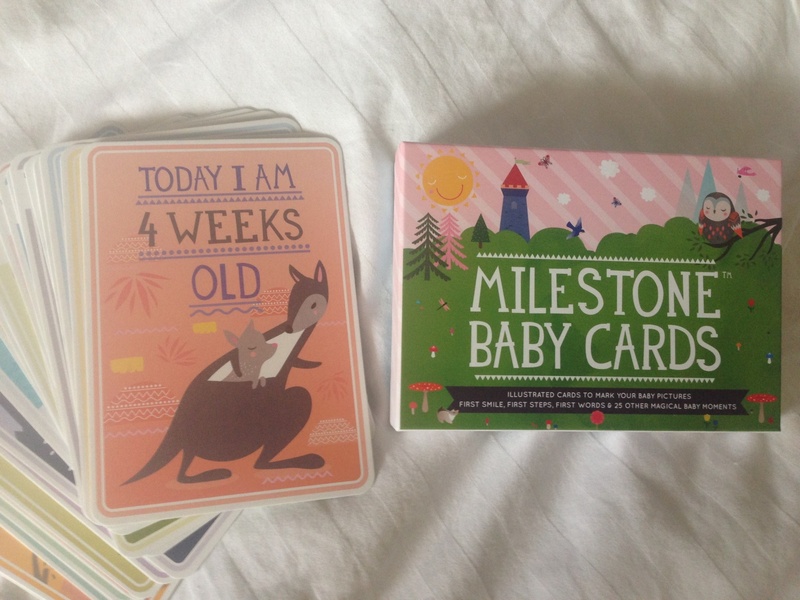 I bought these milestone cards for photos with W – love them! How did you feel about going out and about with your 4-week old? When did your body get back to normal? When did the sleep patterns get back to normal? I’d love to hear from you! 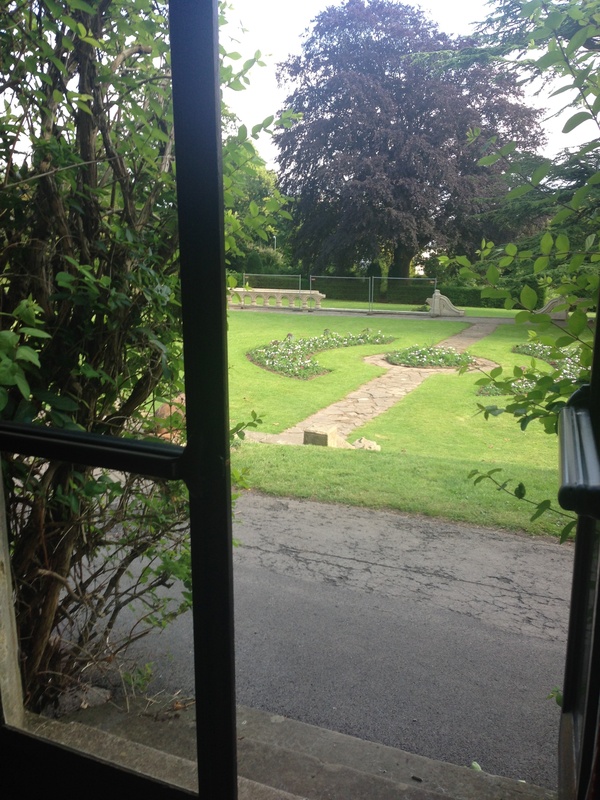 Read my previous weekly updates here – week 1, week 2 and week 3. 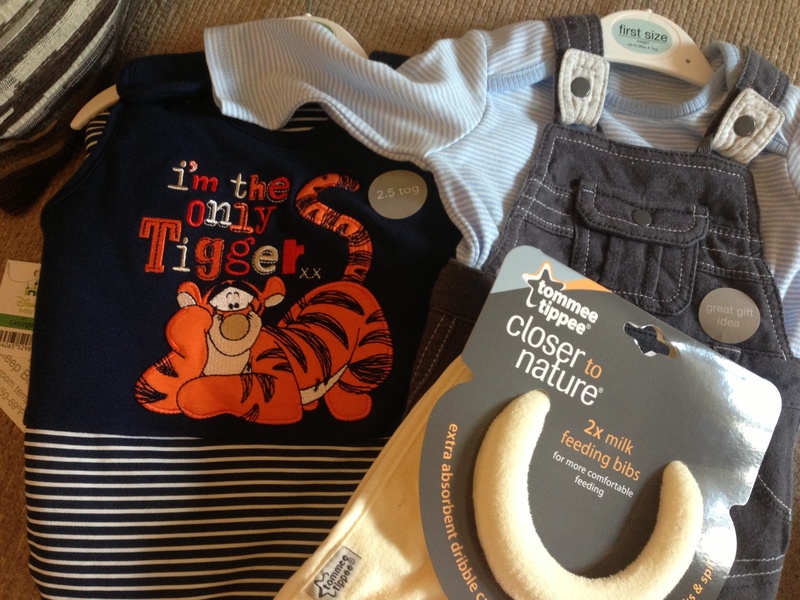 Author yummybloggerPosted on June 1, 2014 September 15, 2014 Format AsideCategories my regular updates, parenting11 Comments on Week 4 – 4th week of being a mummy – wind and trips out! 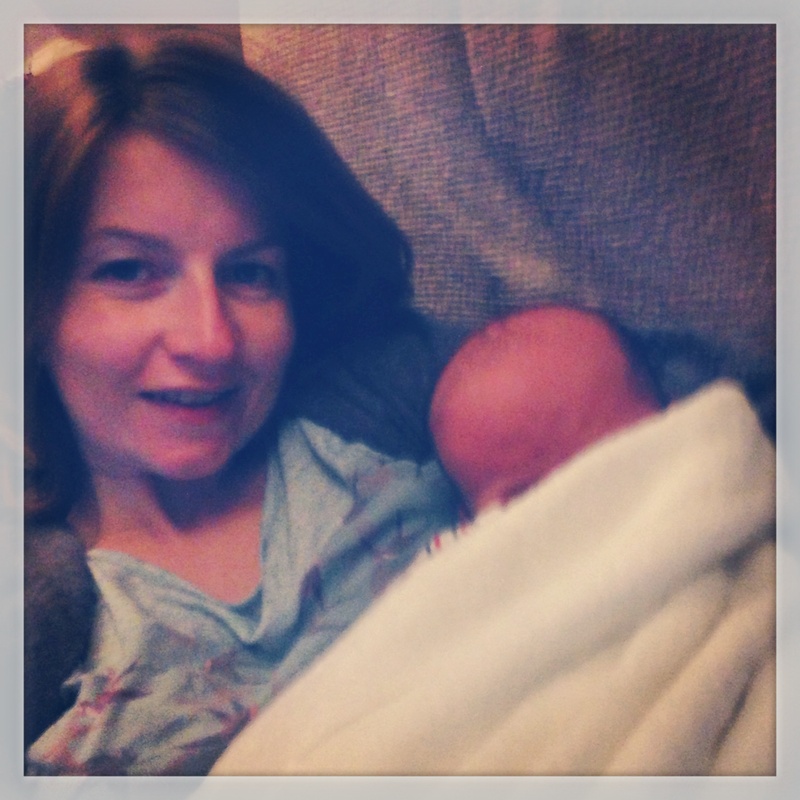 Week 3 – 3rd week of being a mummy – sleepless nights! I still love him SO much – I love it when he’s awake and looking around (not that often!! ), I love his headbanging move and the ‘fist confusion’ when feeding, I love how sound asleep he is when I hold him… I love watching him have Daddy cwtches… I love his little noises whether he’s awake or asleep…. 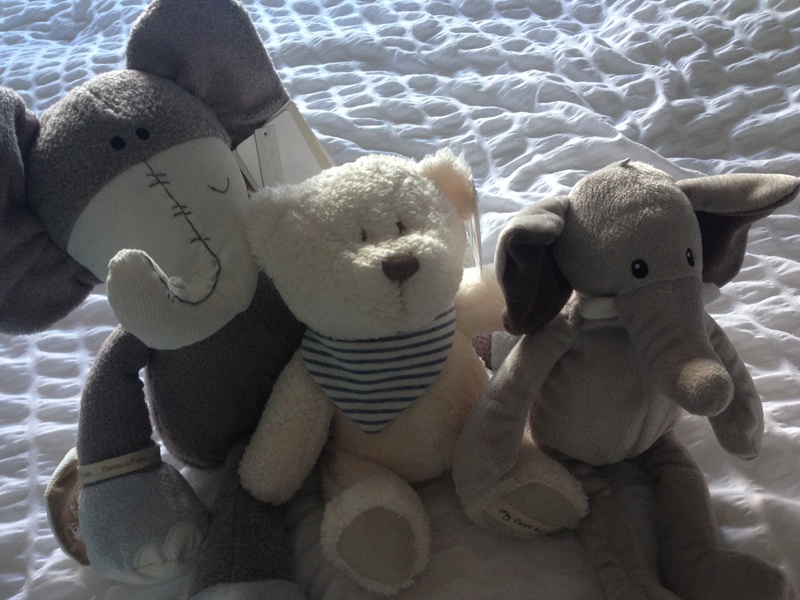 love, love, love…. More visitors this week – 2 of my good friends – it’s been so nice hosting visitors, they all adore him and it’s broken my week up nicely! Sunday was sunny and we over to the in-laws for sunday dinner then sat in their garden all afternoon – was funny seeing W sleep through all sorts of drilling and other loud DIY noises being made by his Bampa! Friday – the health visitor weighed him and he’s now 8lb 6oz! 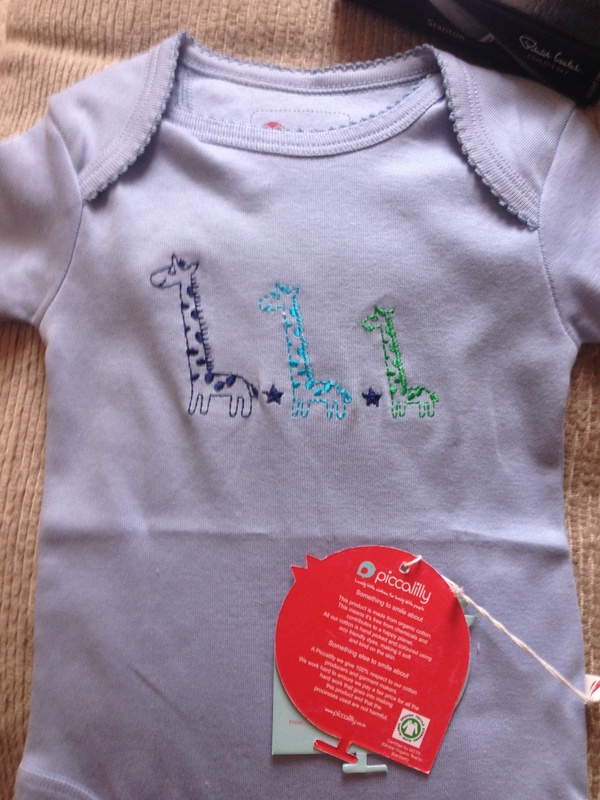 So 1lb 4oz heavier than his birth weight – all on target and unbelievable that my milk alone can do that! Friday afternoon I took him out in the car by myself to see a friend…. it was a sense of achievement 1) fitting the car seat by myself (thank god for youTube videos!) and 2) driving miss daisy! Next challenge: car plus pram! 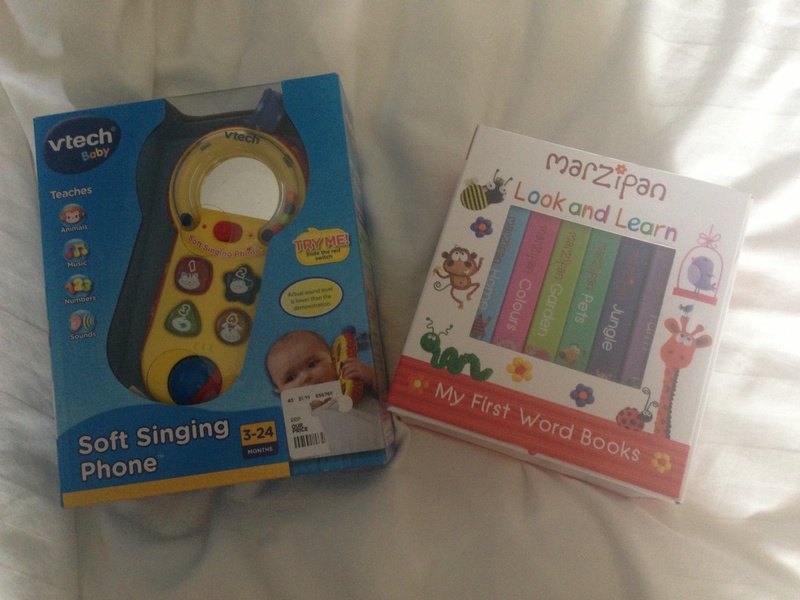 In addition to all the gifts I listed in his haul, his presents keep acoming…. 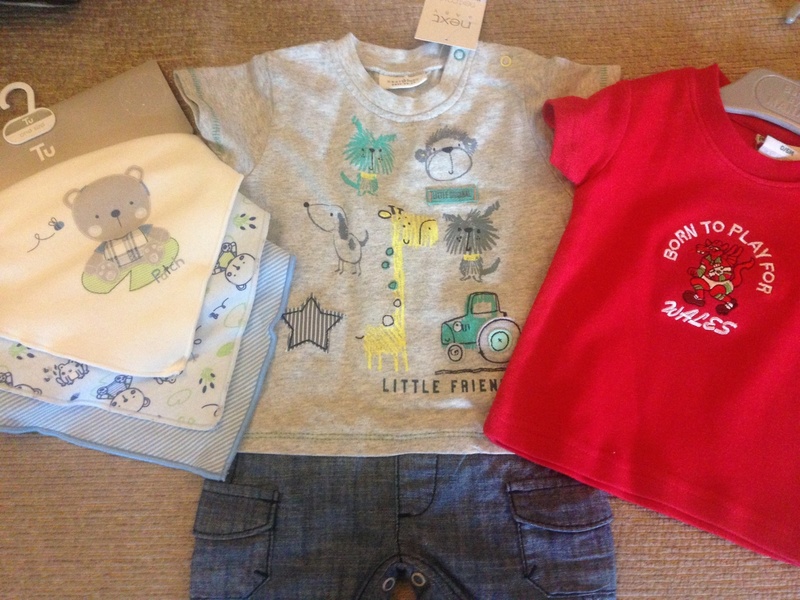 Gifts from a Great Aunt and Uncle – outfit from Next, bibs from Tu and a Welsh T-shirt! 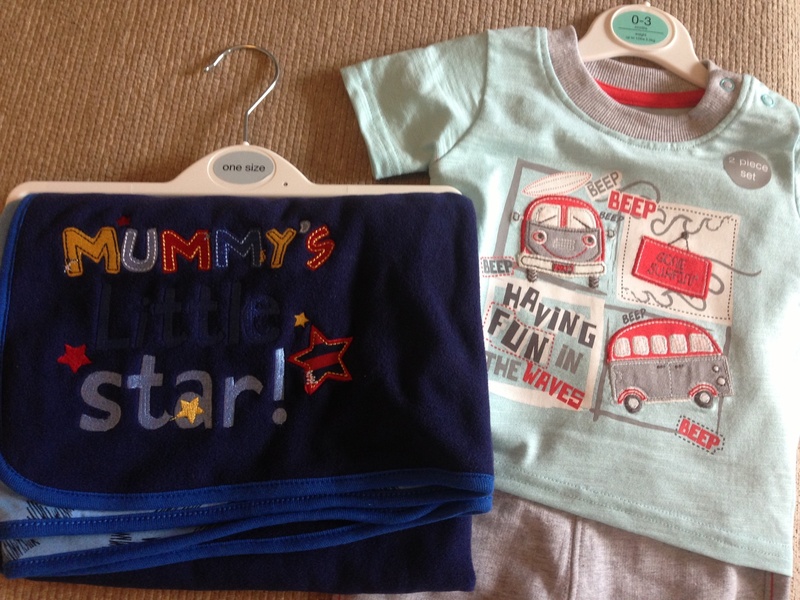 So either because of the hot weather and/or a growth spurt (according to internet sources) or maybe as I dared to suggest last week that we had some routines… this week, we had some tough nights! 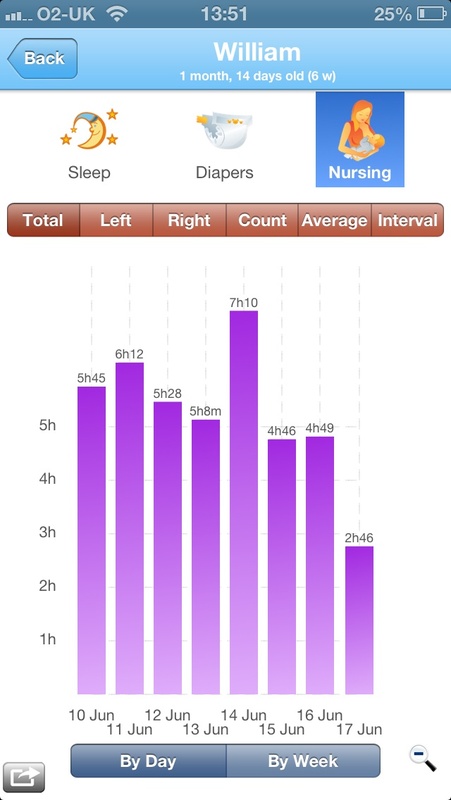 Alas, it was not to stay like that.. Wednesday night was tough…. he had a mammoth 2 hour feed in the evening (9pm-11pm-ish) so I figured he’d have a great nights’ sleep but no I ended up feeding him on and off for about 4 hours (between 2.30am and 6.30am) – every time I put him down, he wanted more – I couldn’t believe this little man could be so hungry! Thursday night – another big feed but earlier on – I think it was about 1.30am-3.30am. Our tranquil turtle nightlight had stopped working, so I was struggling with light and checking every time I put him down – so I took him and the moses basket to the spare room and as soon as we settled in there, he slept through from 3.30 til 7.30 = Bliss!!! 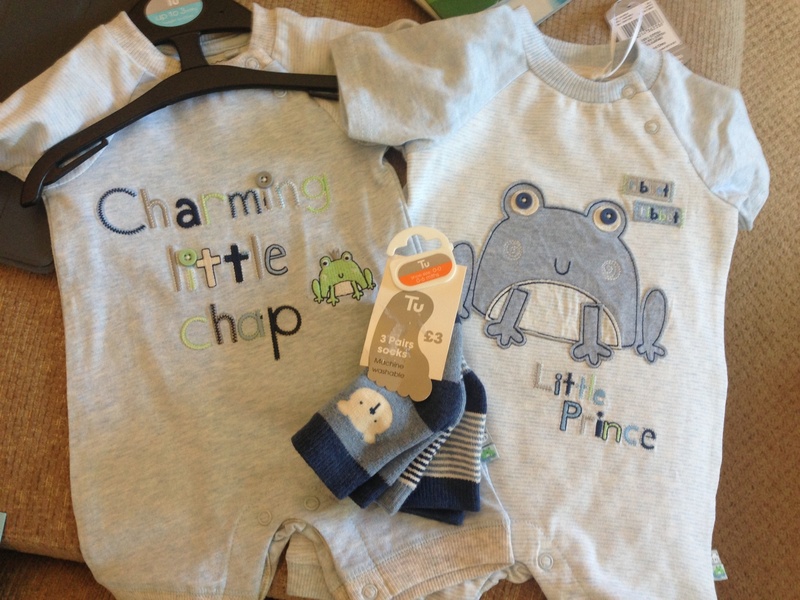 He peed on his face when I was changing his nappy one time – ooooops! 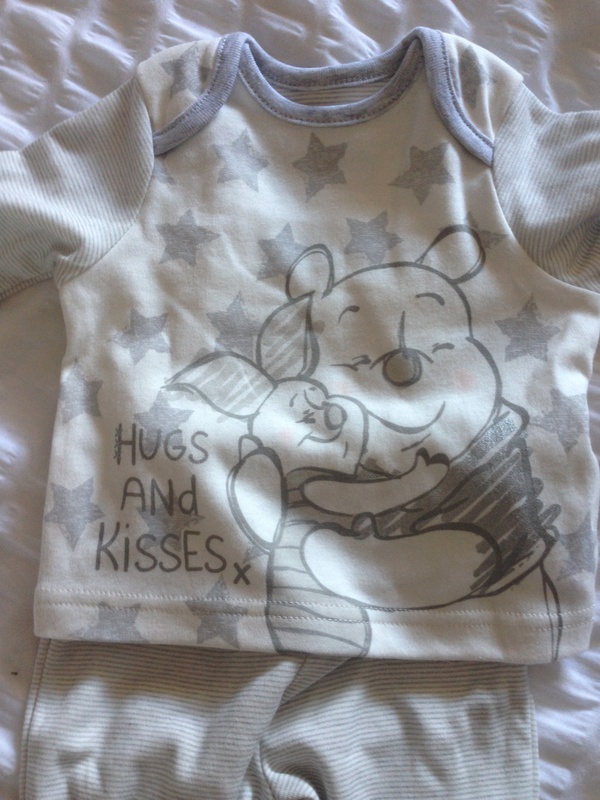 Author yummybloggerPosted on May 25, 2014 September 15, 2014 Categories my regular updates, parenting11 Comments on Week 3 – 3rd week of being a mummy – sleepless nights! 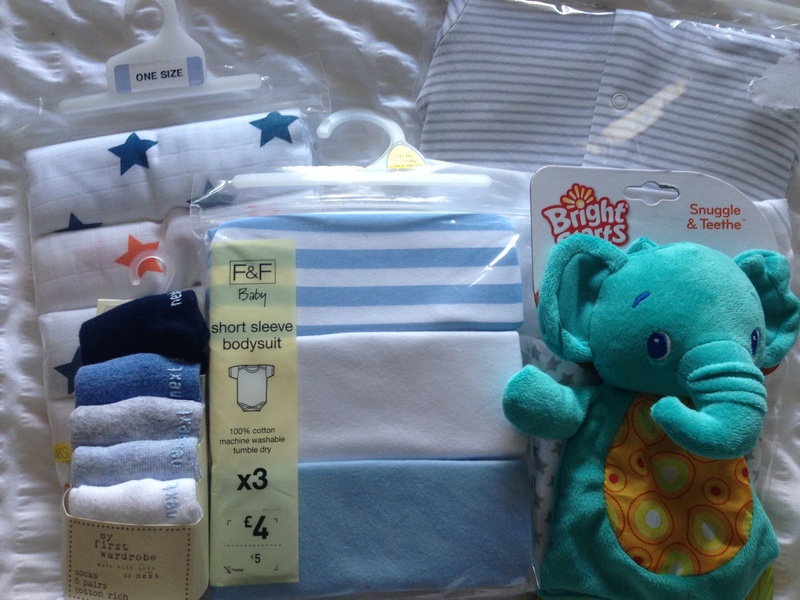 Baby W’s first fortnight in presents! Most of these are months 0-3 and will keep us very well-stocked! 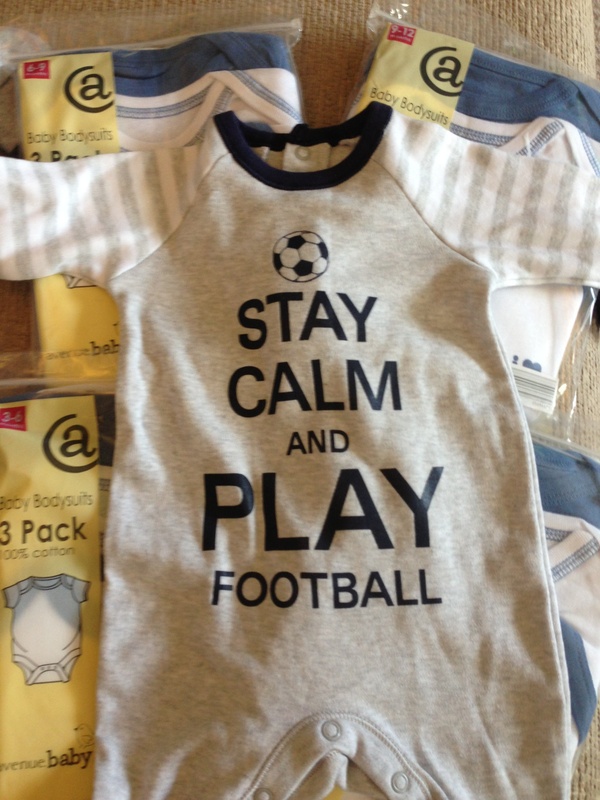 Football sleepsuit and lots of babygro’s from Nanna! 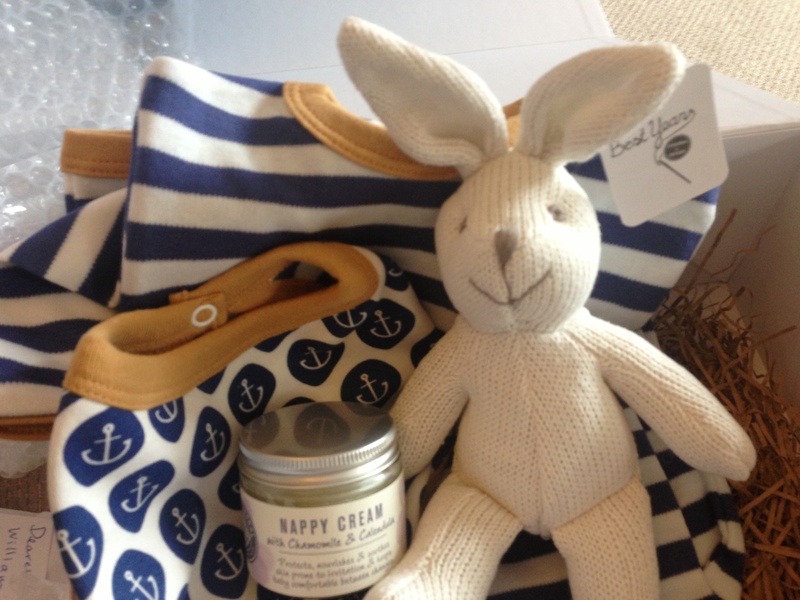 Gorgeous set from good friends down under via littlelavendertree.co.uk – gorgeous organic babygro and bib, cute bunny and natural nappy cream that we’ve already had to start using! 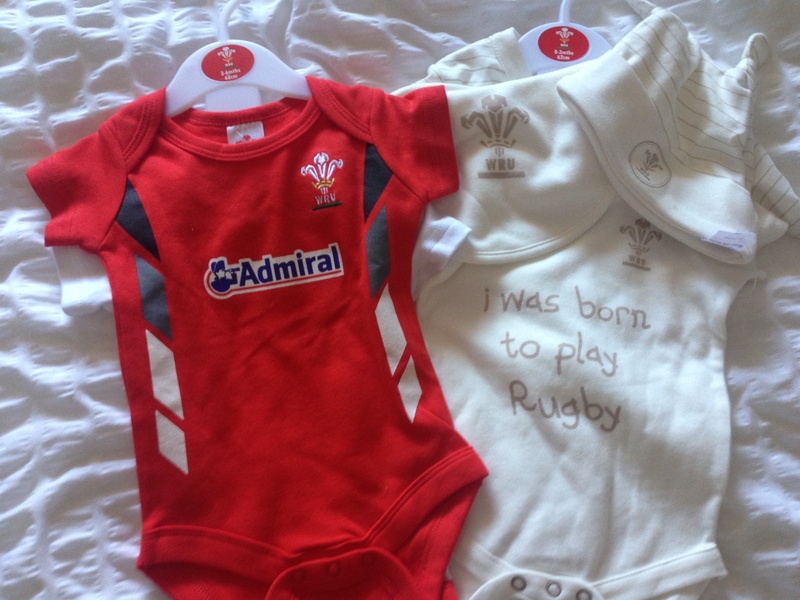 Welsh rugby outfits from Auntie Sioned – with these long legs he will be sporty! 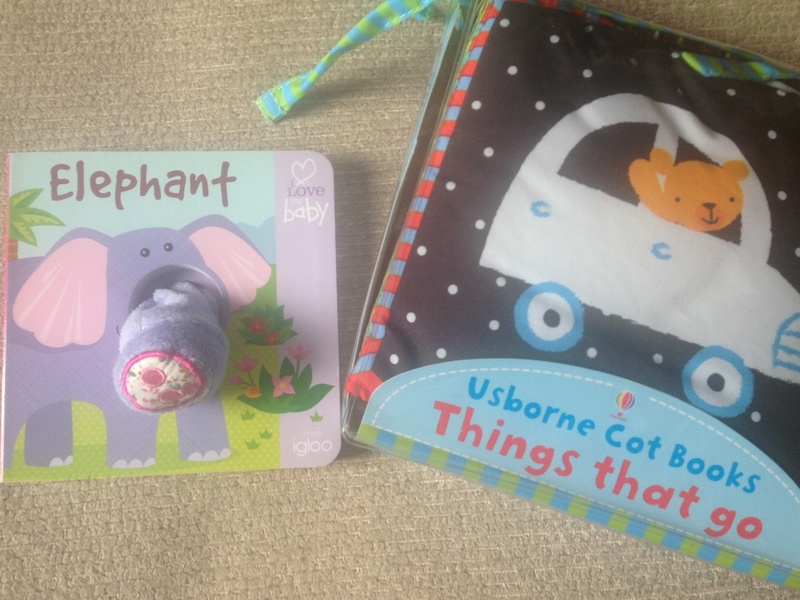 We received so many lovely gifts that I never would have thought of buying…. 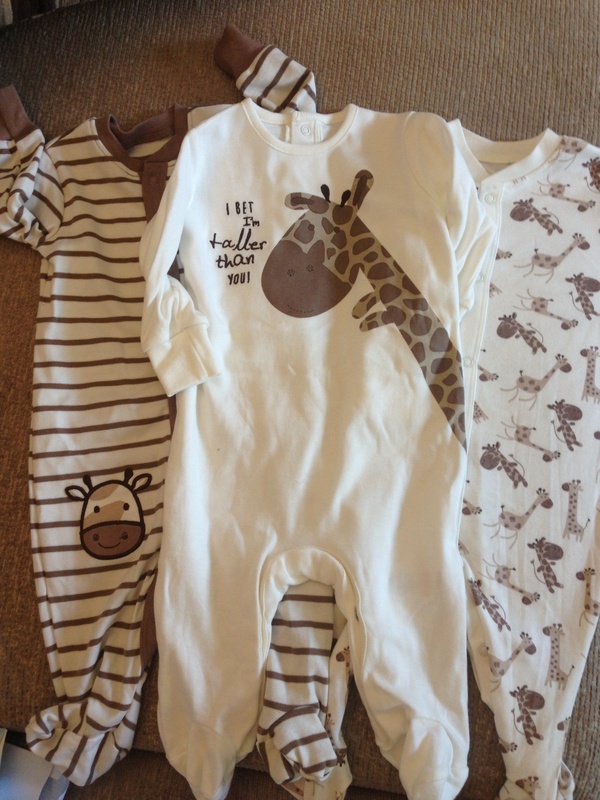 baby W has been spoilt rotten! 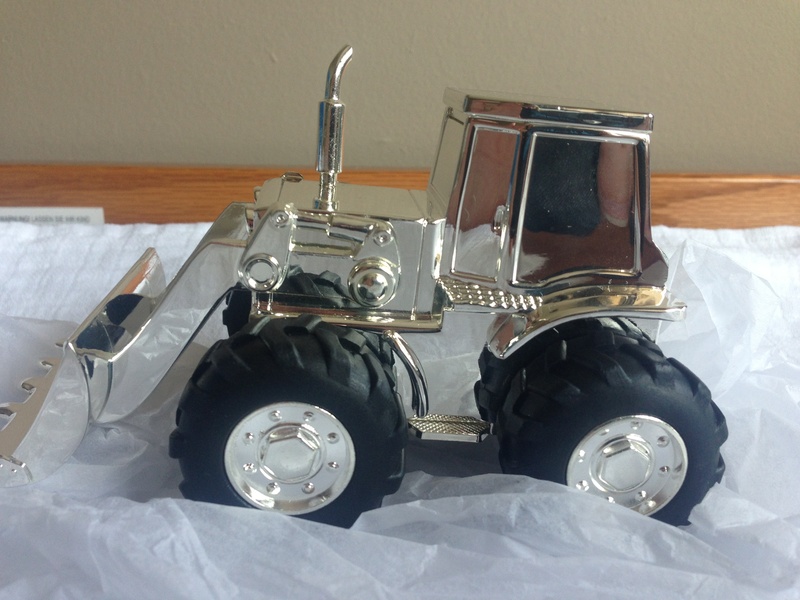 Love this little Tractor from our next-door neighbour! 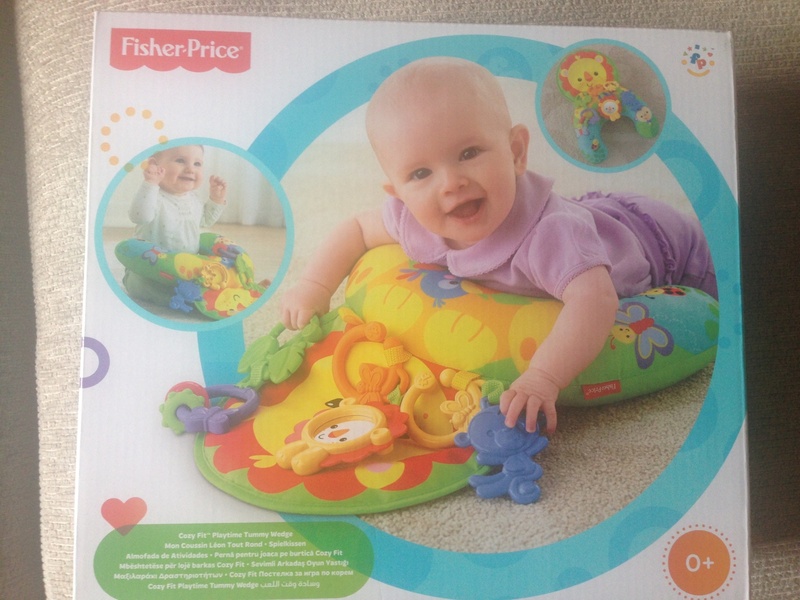 Fisher-Price tummy-time play wedge from the O’shea’s – can’t wait til he starts using that! 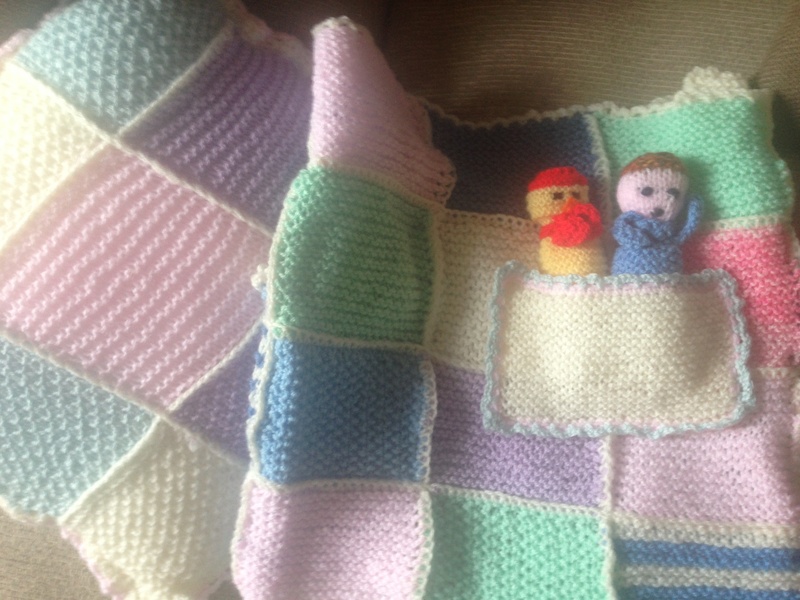 Blanket and cushion knitted by W’s Great-Grandma! yummyblogger.com Create a free website or blog at WordPress.com.